In my “spare” time I do a lot of things; these include disparate things such as volunteering at sausage sizzles (I was at Mitre 10 yesterday) and being part of the board of the association of Spanish Researchers in Australia-Pacific (SRAP). This post is not about sausage sizzles, although I have to say that there is some “science” there to be explored. 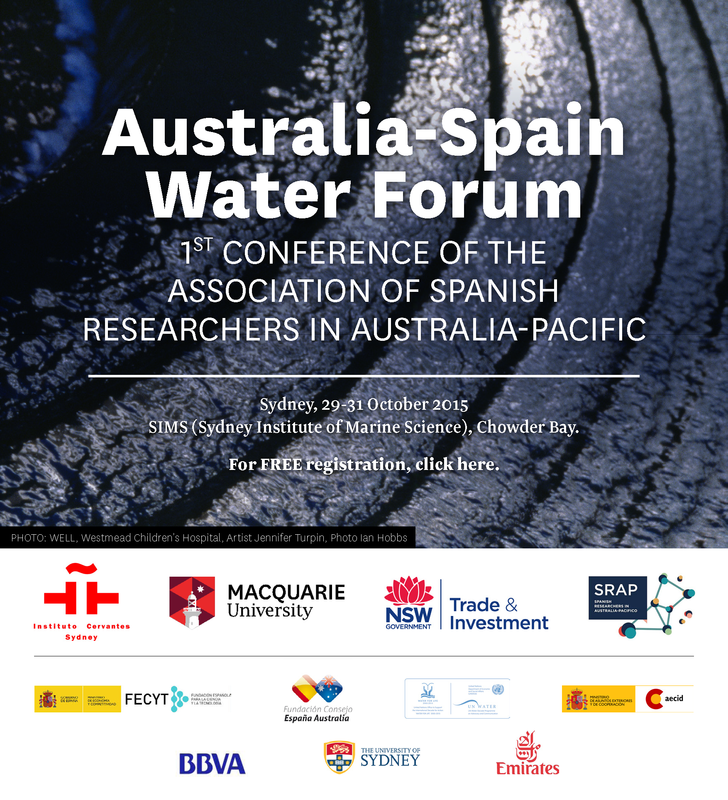 This post is about the Australia-Spain Water Forum, a science dissemination event that I am organizing as part of the SRAP. Back in 2014 the president of the SRAP, Luis Salvador-Carulla, the director of the Instituto Cervantes in Sydney, Victor Ugarte, and myself started talking about organizing a round table about water from different perspectives. The idea was to have a scientist, a manager and an artist (or something like that) and have a lively debate about water issues. This sounded like a very cool idea and it was to happen in late 2014. Unfortunately we did not get the funding last year and so it had to be postponed to this year. This year we searched and found greater financial support and the humble round table grew and grew until becoming a 3 day event that will be held at beautiful SIMS between the 29th and the 31st of October 2015. The first day we start in the afternoon with a round table on water scarcity and management following on a cultural and historic perspective on water. The second day includes the science of coasts, science and industry and sustainable water. The third day, only until lunch time, is a special session about Spanish and European researchers in Australia where there will be discussions about European collaboration. The event, thanks to our funding partners and sponsors, is free and open to everyone. We have worked very hard to curate a broad program that appeals to scientist and managers and also to the general public. The process has been complicated at times, with many nights devoted to it (remember that I do this in my “spare” time). So, why should scientists do science dissemination? To transfer our knowledge: to get away from our “ivory towers” and share our knowledge and skills. This is the first time that I organize a science dissemination event, and I am quite nervous about the final result. I hope that everything goes well and reflects the hours that many of us in the SRAP have put into the organization of this event. It would be great to have as many people attending as possible (and to have your feedback afterwards). Did I mention that there will be a cocktail on the first day, tapas and black paella on the second and a paella on the third? ← New GRG “babies” have finally arrived! !